Presented in a question-and-answer format for easy reading and retention, “Reviewer on Katarungang Pambarangay” is a handy instructional material for the barangay authorities on the essentials of the Katarungang Pambarangay. Discussions are based on actual controversies resolved by the Supreme Court and opinions of the Department of Justice and Department of the Interior and Local Government. 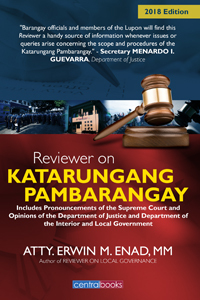 DOJ Secretary Menardo I. Guevarra described the book as “handy source of information whenever issues or queries arise concerning the scope and procedures of the Katarungang Pambarangay.” DILG Secretary Eduardo M. Año welcomed the publication of the book as it will “serve as a guide to the Lupon Tagapamayapa on the structures, procedures, application of the Katarungang Pambarangay Law for a more effective resolution of barangay disputes.” The book is also ideal for local officials, DILG officials, law students, lawyers and the reading public with continuing interest in the barangay justice system.